I was faced with having to root prune the tree which I had purchased to plant in a container, against the advice of the experts at the nursery. I recruited Clint to help me with this effort to root prune a 7 year-old Camphor Tree we have growing in a container in our courtyard. 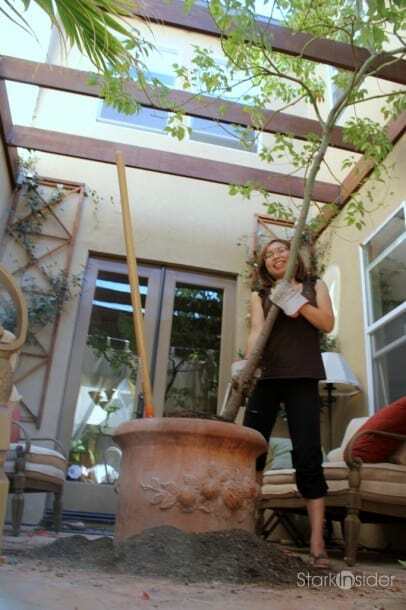 I recruited Clint, my better half, to help me with this effort to root prune a 7 year-old Camphor Tree we have growing in a container in our courtyard. We have a Camphor Tree in a large terracotta container in our courtyard that I adore. We’ve had it for the last 7 years and it adds a nice dappled shade to the area in the hot summer months. I like to sit under it and read or just day dream. I had purchase the Camphor Tree against the advice of the experts at the nursery. This was 7 years ago so I was perhaps a little foolhardy. Among the rows of trees, I had spotted it. Loved the leaves, the shape and the fact it was evergreen and no cautionary tale about the size this tree actually grows to in nature was going to dissuade me from my selection. Although I am showing the process for a Camphor tree, root pruning is important to perform on your container-grown fruit trees as well every three to five years. In fact, any tree showing signs of reduced vigor after several years may be an indication that it is root-bound. 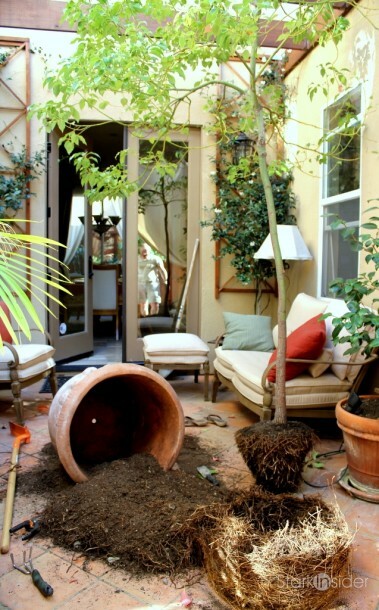 The idea is that as plants or trees grow in containers, their roots also grow. There are two main types of roots, those that the tree uses to hold itself in place and those that it uses to gather nutrients and water. The latter are the younger roots. As a tree grows, the container gets crowded with roots that get old and serve to stabilize the tree structurally. This makes sense… in nature with infinite soil, a tree should invest in large roots to help it grip onto the earth should a fierce wind try to blow it over. 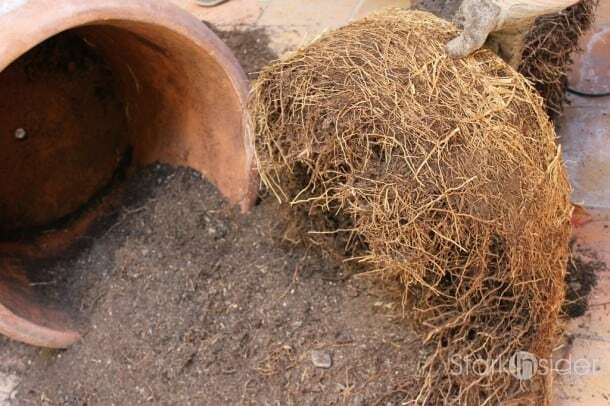 In a limited sized pot, the younger, nutrient gather roots are crowded out and in search of places to go, the roots literally chase their tail and become “root-bound”. Root pruning involves severing a portion of the roots so that it promotes growth of young roots. I wasn’t sure if root pruning would work. But seeing that the tree would die otherwise, there was no risk in trying. After a couple of weeks, from the surgery outlined below, I am happy to report my Camphor tree is doing well. The main tools you need are a drain shovel and a willing spouse. 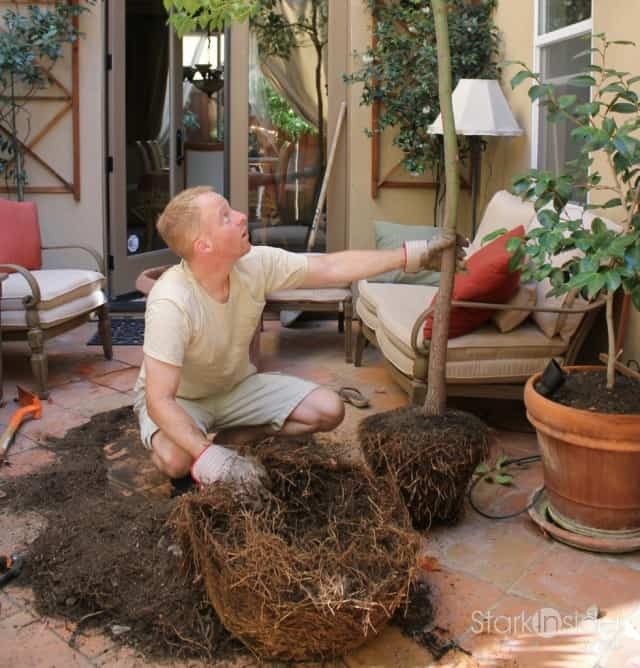 Also after you remove a large mass of the root system, you will want to replace the old soil with fresh, nutrient-rich soil. In some how-tos on root pruning, they suggest you take the entire plant and soil out of the container. Unfortunately, this works in mild cases of root bound. In extreme cases, like what we discovered we had, the roots are so tightly bound that they are pushing on the walls of the container with great pressure. 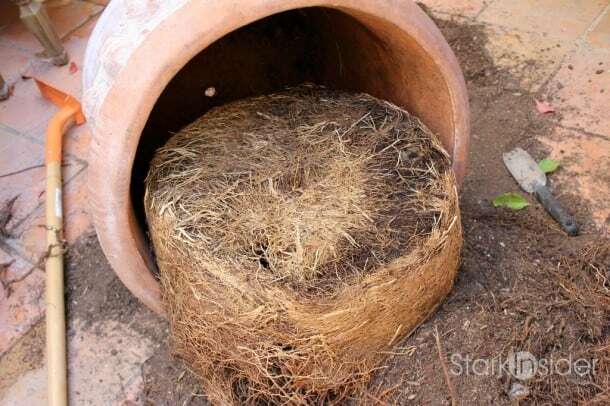 Short of breaking the container, it is hard to release the entire container of soil and roots at once. We didn't want to break the container either because we were going to plant it back into the same pot. Also, with such a large container, the walls are so thick, it would also be challenging to break apart. Instead, we used a drain shovel and started to cut into the soil around the tree as close to the container edge as possible. This process takes patience and perseverence. After going as deep as we could vertically, moving away the loose soil as we progressed, we started to work away at the root at a 45-degree angle. Ultimately, the the root came out in the shape of a diamond. We finally got the tree out by cutting away the last roots between the tree and the heavily root bound bottom of the container. The mass of roots you see in the foreground are the actual amount of roots that had accumulated over 7 years at the bottom of the container. No wonder the tree was starting to slowly die! Close up of the tree roots. 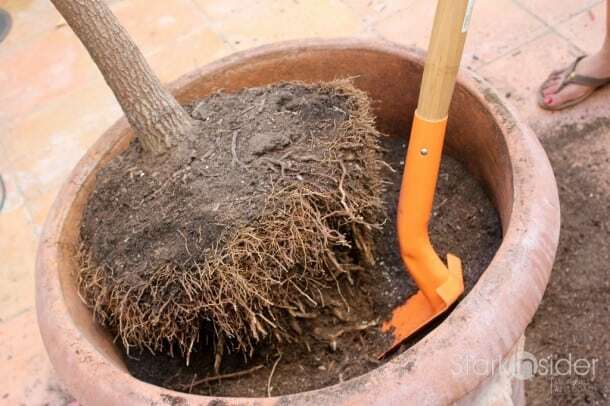 Some say that you should only cut away 1/3 to 1/2 of the roots before repotting. In this case, we estimate about 2/3+ of the roots were cut off. We were nervous about whether the tree would survive. So far it has been 3 weeks and the tree looks healthier than it has all season. We have our fingers crossed and continue to monitor it. Side view of the root we cut off. You can see the detail of the root system in this root mass from this close up. This is like the photo where someone is standing proudly, holding a big fish they have just caught. Only in this case, I am standing next to my Camphor tree at a moment when we realize we were going to be able to get it out of the container by ourselves. Anyways, I just wanted to share our experience should you find yourself in a similar situation. After we replanted the tree, we have been making sure the soil is consistently moist. 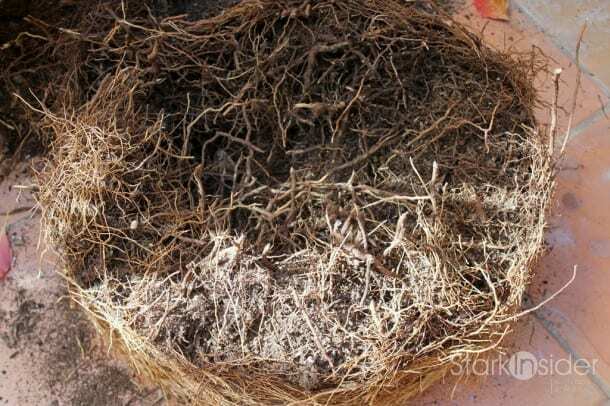 With so much root mass loss, your tree or plant will be especially vulnerable to dryness and lack of nutrients until it starts growing back its root system. 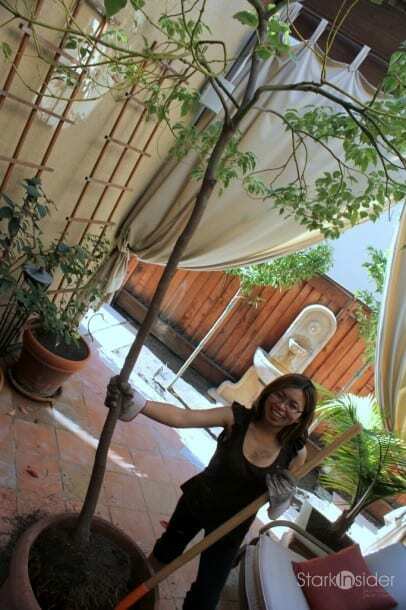 I use a gentle solution of water and dissolved fertilizer and make sure to feed the tree every day. I plan to do this for at least the next 6 months. I figure I will need to do this process again in about 3 years.